September 19, 2013 - Boeing will complete production of the C-17 Globemaster III and close the C-17 final assembly facility in Long Beach, Calif. in 2015. "Ending C-17 production was a very difficult but necessary decision," said Dennis Muilenburg, president and chief executive officer of Boeing Defense, Space & Security. "We want to thank the highly skilled and talented employees who have built this great airlifter for more than two decades– and those who will help us as we continue to build the remaining 22 aircraft and support and modernize the global fleet for decades to come. 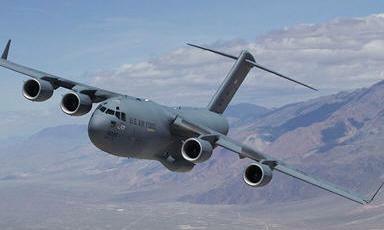 The C-17 remains the world's most capable airlifter with unmatched readiness and cost effectiveness." Boeing expects a charge of less than $100 million, which will be recorded this quarter, as a result of this announcement. The charge will not impact financial guidance for the year. Nearly 3,000 employees support the C-17 production program in Long Beach; Macon, Ga.; Mesa, Ariz. and St. Louis. Workforce reductions will begin in early 2014 and continue through closure. Boeing will provide employee assistance including job search resources, financial counseling, retirement seminars and help locating potential jobs within and outside of the company. Since the first flight on Sept. 15, 1991, the C-17 has amassed more than 2.6 million flying hours supporting airlift of troops and large cargo, precision airdrop of humanitarian supplies and lifesaving aeromedical missions. Boeing has delivered 257 C-17s, including 223 to the U.S. Air Force, and a total of 34 to Australia, Canada, India, Qatar, the United Arab Emirates, the United Kingdom and the 12-member Strategic Airlift Capability initiative of NATO and Partnership for Peace nations.